Some people really object to staying in hotels run by large chains. Their objections are understandable: a globalised one-size-fits-all service that lacks any individual character; a centralised corporate approach to design that makes it difficult to tell whether you’re in Beijing or Barcelona and so on ad infinitum. If any of these complaints were ever true, then it the international Sofitel chain can hardly be accused of such crimes with their newest hotel in Vienna. 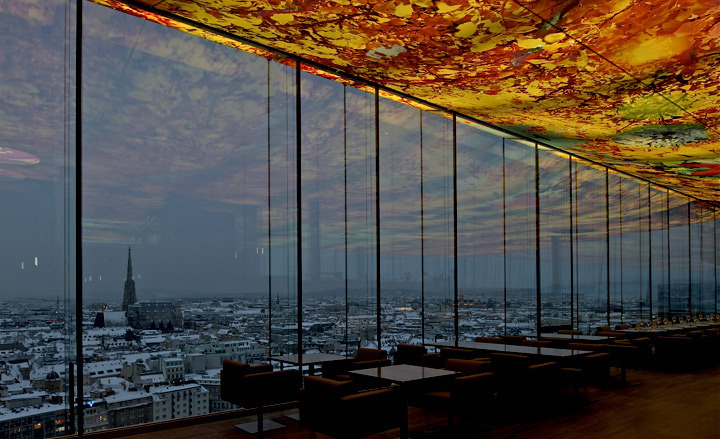 For a start, the Sofitel Stephansdom nestling beside the Danube in the Austrian capital is designed by august French architect Jean Nouvel. Nouvel has something of a reputation for his clever architectural approach to colour and the latest addition to the Sofitel chain is no exception. Effectively a series of stark geometric shapes, their vertical silhouettes and volume are marked out by a highly neutral palate of light grey and transparent glass. During the day their simple geometric volumes are actually marked out by the lack of colour. 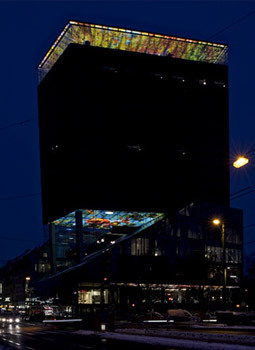 But, when night falls, a number of the building’s horizontal surfaces burst into colour: at the street-level entrance; on the very tall ceiling of the lobby formed by the underside of the main accommodation block standing on columns and on the cantilevered ceiling of the rooftop restaurant that appears to be floating above the full-length glass walls that surround it on all sides. What’s more, is that this is not just any colour, but three commissioned works by the renowned Swiss artist Pipilotti Rist. Their abstracted and swirling compositions combining elements from nature – such as leaves during different seasons and bursts of sky- not only bring dramatic colour to key horizontal borders of the building’s form, but their complex swirling compositions seem to bring an element of movement too, as if the decidedly static volume of the neutral bulk of the hotel were thrown into a kind of animation. Reflections and the interplay between neutral surfaces and almost psychedelic colour are a theme that reoccurs throughout the hotel that acts as a kind of kaleidoscope. Here and there, complex reflections of the neighbouring buildings, including the historic St Stephen’s cathedral from which it takes its name, tumble through the buildings multifaceted glass surfaces. The effect is almost as if the visual aspects of the surrounding area are dragged deep into what at first seems a fairly neutral buildings or that the art works that are placed at strategic points echo elsewhere within the spacious voids. This neutrality that only underscores the drama of the colour where it occurs, is an important part of the building’s overall concept and forms the basis of the décor for the 182 guest rooms housed in the tower. With dramatic views of beautiful Vienna, the rooms are furnished in sleek modernist lines with colour schemes of either soft grey or black and white.